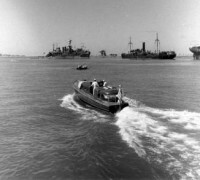 The Fourth Fleet also had in its roster 20 crash boats and coast guard vessels patrolling harbor and adjacent coastal waters off Recife, Natal and Bahia in assistance to the huge fleet anchored at Recife. These tiny ships performed their exhausting tasks with steadfastness and determination. Crews were acknowledged for their contribution in all assigned duties. The 12th ERBS was based in the Caribbean and South Atlantic Ocean. This unit had boats at both ends of the Panama Canal, and at the island bases from Miami, FL to Recife, Brazil. The Squadron used both 104’ and 63’ types. The 104' boats did not have the desired speed that the 63' boats possessed. The 63' boats did not have the desired range that the 104' boats had. 83302 (ex-CG 452) 1941-44 assigned to the EASTSEAFRON-stationed at New York. NY; 1944-45 assigned to SERVLANT (COM4THFLEET}-stationed at RECIFE, BRAZIL. 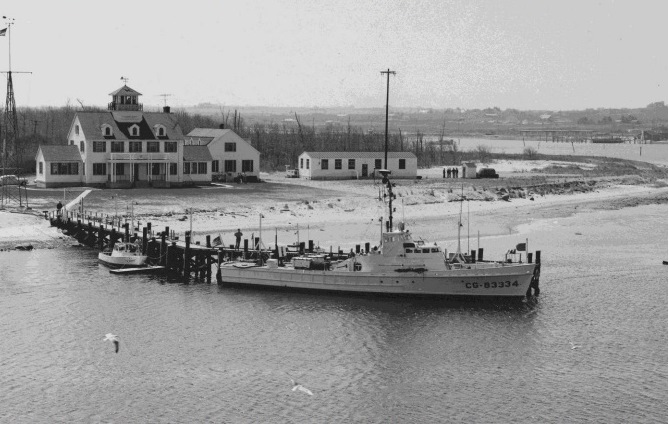 83335 (ex-CG 485) 1942-44 assigned to the EASTSEAFRON-stationed at Cape May. NJ; 1944-45 assigned to the SERVLANT (COM4THFLEET)-stationed AT RECIFE, BRAZIL. Below, the previous 83334 survived the war and is seen at Montauk Station on Long Island, NY 16 Apr 1959. 83341 (ex-CG 492) 1942-44 assigned to the EASTSEAFRON-stationed at Southport. NC; 1944-45 assigned to the SERVLANT (COM4THFLEET)-stationed at RECIFE, BRAZIL. 27 Oct 45 decommissioned. 83344 (ex-CG 495) 1942-44 assigned to the EASTSEAFRON-stationed at Portland. ME; 1944-45 assigned to the SERVLANT (COM4THFLEET)-stationed at RECIFE, BRAZIL. 1 Nov 45 decommissioned. 83369 (ex-CG 620) 1942-44 assigned to the EASTSEAFRON-stationed at Savannah, GA; 1944-45 assigned to SERVLANT (COM4THFLEET)-stationed at RECIFE, BRAZIL. 83448 Jun 43 delivered; 1943-44 assigned to the GULFSEAFRON-stationed at Miami, FL; 1944-45 assigned to SERVLANT (COM4THFLEET)-stationed at RECIFE, BRAZIL. 83449 Jun 43 delivered; 1943-44 assigned to the GULFSEAFRON-stationed at Miami, FL; 1944-45 assigned to SERVLANT (COM4THFLEET)-stationed RECIFE, BRAZIL; Apr 45 assigned to the COM7THFLEET-stationed at ABHD Guam (B2A5); 20 Jan 58 surveyed and burned. During her stay in Brazil CG 83449 also paid relevant service when was detached to Bahia in support and escorting Brazilian submarines involved in ASW exercises off Salvador with other Brazilian and US Navy vessels and air units. 83474 Aug 43 delivered; 1943-44 assigned to the GULFSEAFRON-stationed at Miami, FL; mid 44 assigned to SERVLANT (COM4THFLEET)-stationed at RECIFE, BRAZIL; Jul 44 assigned to the EASTSEAFRON-stationed at Norfolk, VA.
83475 Aug 43 delivered; 1943-44 assigned to the GULFSEAFRON-stationed at Miami, FL; 1944-45 assigned to SERVLANT (COM4THFLEET)-stationed at RECIFE, BRAZIL. 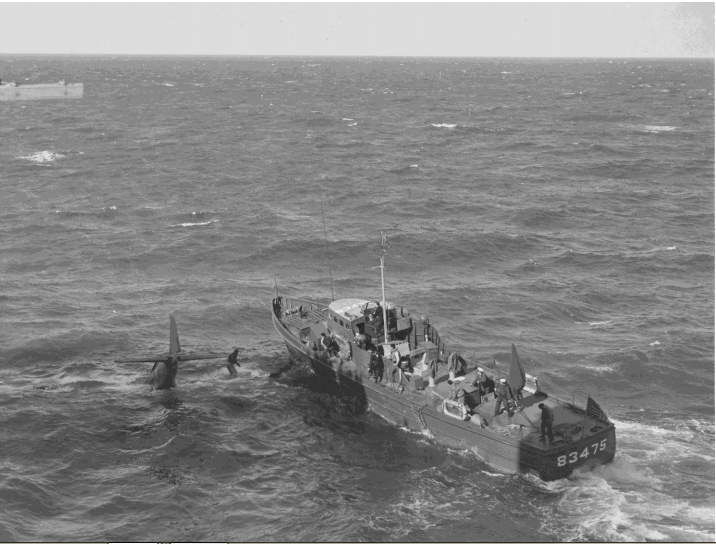 Above, CG 83475 is seen in action somewhere in the Atlantic during a mission to rescue survivors from one navy aircraft. By James Flynn Jr. USNR Ret. 83481 Aug 43 delivered; 1943-44 assigned to the EASTSEAFRON-stationed at Boston. MA; 1944-45 assigned to SERVLANT (COM4THFLEET)-stationed at RECIFE, BRAZIL; 4 Mar 59 decommissioned; 30 Dec 59 sold. 83482 Sep 43 delivered; 1943-44 assigned to the EASTSEAFRON-stationed at Boston. MA; 1944-45 assigned to SERVLANT (COM4THFLEET)-stationed at RECIFE, BRAZIL; Apr 45 assigned to the COM7THFLEET-stationed at ABHD Guam (B2A5); 4 Nov 59 decommissioned; 18 May 60 sold. 83483 Sep 43 delivered; 1943-44 assigned to the EASTSEAFRON-stationed at Boston. MA; 1944-45 assigned to SERVLANT (COM4THFLEET)-stationed at RECIFE, BRAZIL; 20 Jun 62 decommissioned: 27 Nov 63 sold. 83484 Sep 43 delivered; 1943-44 assigned to the EASTSEAFRON-stationed at Boston, MA; 1944-45 assigned to SERVLANT (COM4THFLEET)-stationed at RECIFE, BRAZIL; 15 Apr 63 decommissioned; 14 May 63 transferred to USN. 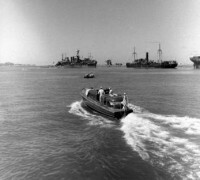 83485 Sep 43 delivered; 1943-44 assigned to the EASTSEAFRON-stationed at Norfolk, VA; 1944-45 assigned to SERVLANT (COM4THFLEET)-stationed at RECIFE, BRAZIL; 7 Oct 52 decommissioned; 15 May 53 sold. 83491 Oct 43 delivered: 1943-44 assigned to the GULFSEAFRON-stationed at Key West, FL; 1944-Jul 45 assigned to SERVLANT (COM4THFLEET) stationed at RECIFE, BRAZIL; Jul 45 assigned to the 8th District-stationed at New Orleans. LA; 9 Dec 60 decommissioned; 15 Mar 63 sold. 83492 Oct 43 delivered; 1943-44 assigned to the GULFSEAFRON-stationed at Key West. FL: 1944-Jul45 assigned to the SERVLANT (COM4THFLEET) stationed at RECIFE, BRAZIL: Jul 45 assigned to the 8th District-stationed at New Orleans. LA.